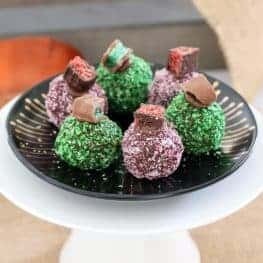 The easiest no-bake Chocolate Ripple Christmas Balls made in two yummy variations – one with chopped up Peppermint Crisp bars and one with Cherry Ripes. YUM!! AND (most importantly), they taste so damn delicious. 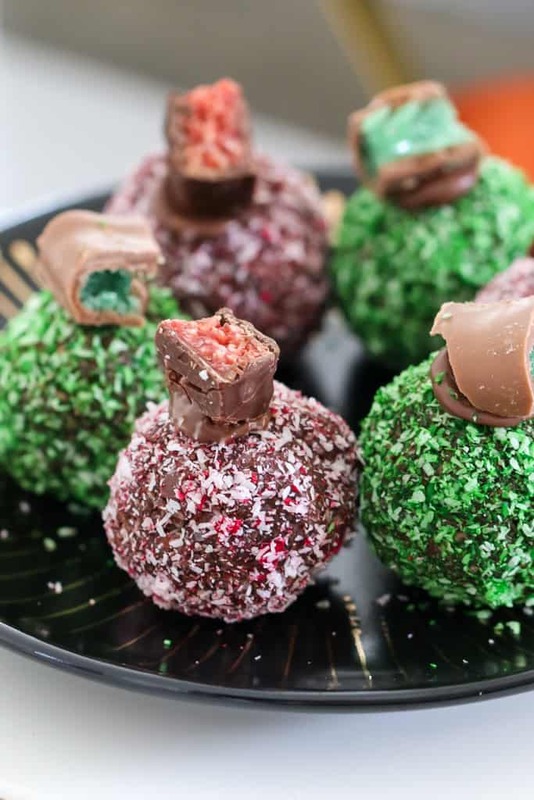 I was tossing up whether to make Cherry Ripe Christmas Balls or Peppermint Crisp Christmas Balls (and if you’ve been visiting Bake Play Smile for a while, you’ll know that I am up there as one of the most indecisive people in the world). And so, I decided to split the packet of chocolate ripple biscuits and make both versions. Good call. Very good call. 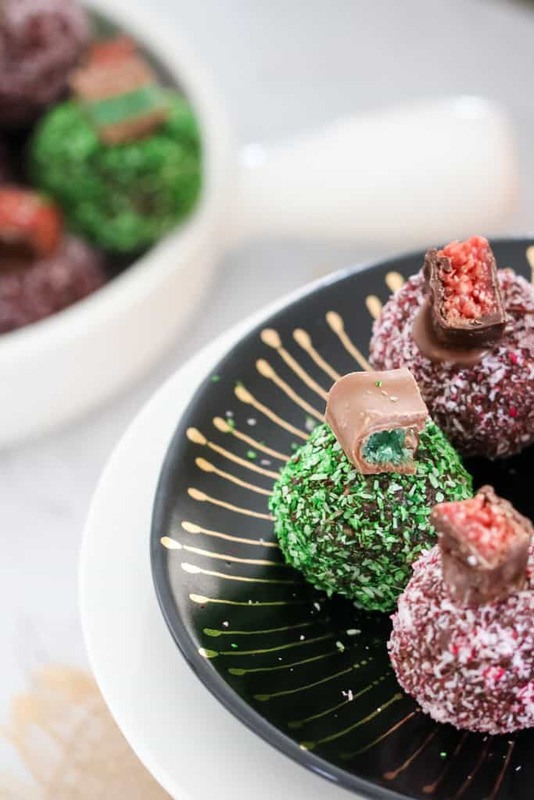 If you’re a massive fan of just Cherry Ripes or just Peppermint Crisps, then feel free to double the recipe and make just 1 batch. BUUUUTTT!! If you like a bit of cherry goodness AND some peppermint deliciousness in your life, then make both. I promise your tummy will thank you. 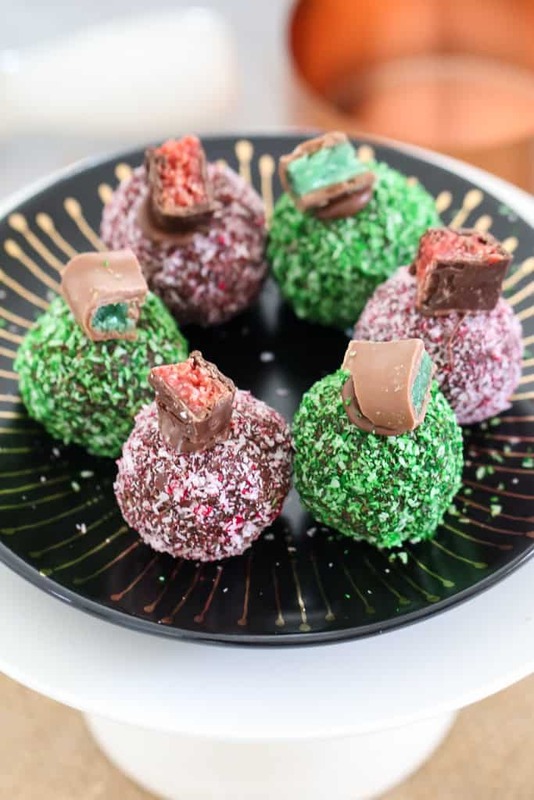 Oooh and in case you’re wondering… these Chocolate Ripple Christmas Balls are virtually exactly the same as my fave Chocolate Coconut Balls – but obviously with the extra chocolates to flavour them. 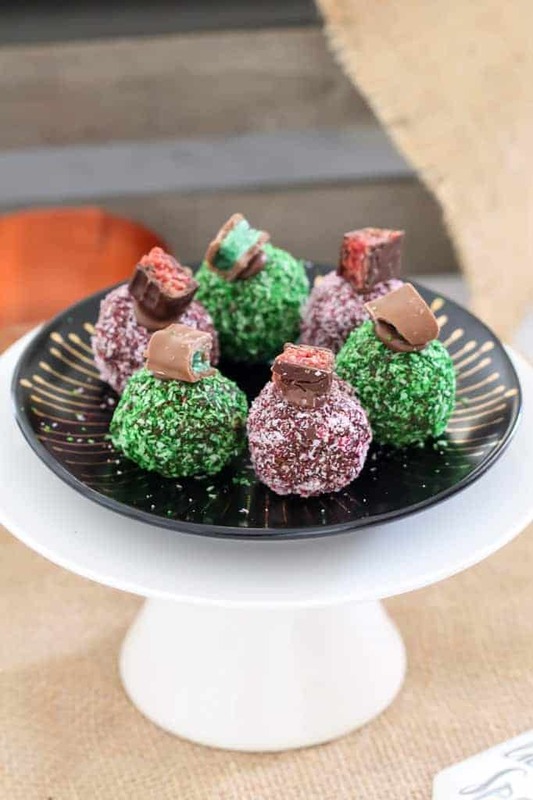 And if you’ve made my good old choc coconut balls (or rumballs) before, then you’ll know how simple these are. And of course, if you’ve got kiddies at home, then this is an awesome recipe to get them involved in. I’ve just bought a little step stool for Will in the kitchen so he can help (and so I don’t have to hold him on my hip the whole time we cook!!). It’s very cute and he calls it his ‘sep ooooool’. Mind you, he’s not the greatest kitchen helper just yet, as he’s pretty big on eating the ingredients as we go. We’ll get there! Anyway, enough of my babbling on.. go grab the ingredients and get these babies going! You’re going to LOVE them!! 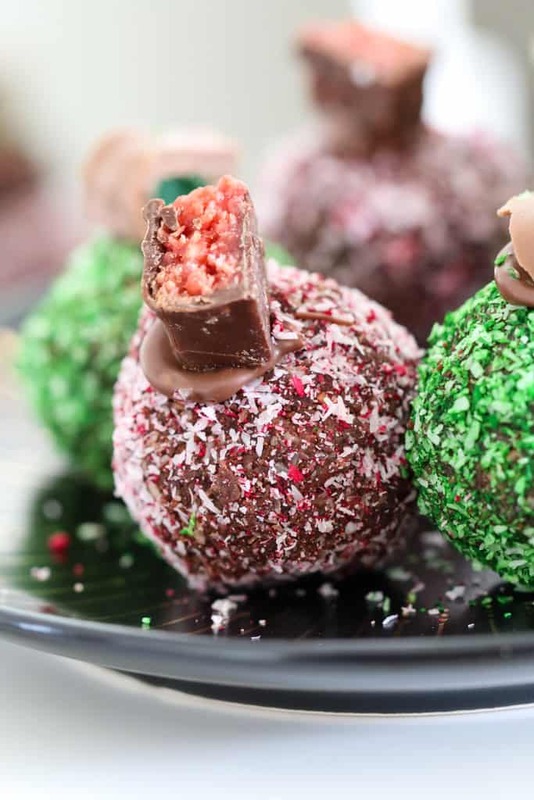 Chocolate Ripple Christmas Balls for the win!! PS. Are you more of a Cherry Ripe or Peppermint Crisp fan?? Or are you just totally indecisive like me?? 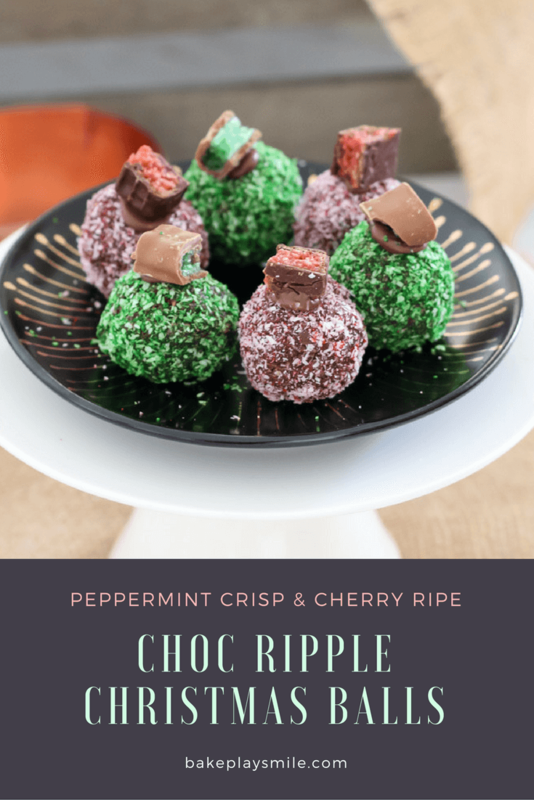 The easiest no-bake Chocolate Ripple Christmas Balls made in two yummy variations - one with chopped up Peppermint Crisp bars and one with Cherry Ripes. YUM!! Place the chocolate ripple biscuits and the Cherry Ripe bars into a food processor and process until they resemble fine crumbs. If using a Thermomix, mix on Speed 8, 5-10 seconds. Place the mixture into a large bowl and sift over the cocoa powder. Add the desiccated coconut and 100g of condensed milk. Mix together the ingredients. If the mixture is too dry to roll into balls, add a bit more of the condensed milk and mix again. Place 1/2 cup of the extra coconut into a ziplock bag. Add the red food colouring and shake until the coconut is coloured red. Place into a bowl. 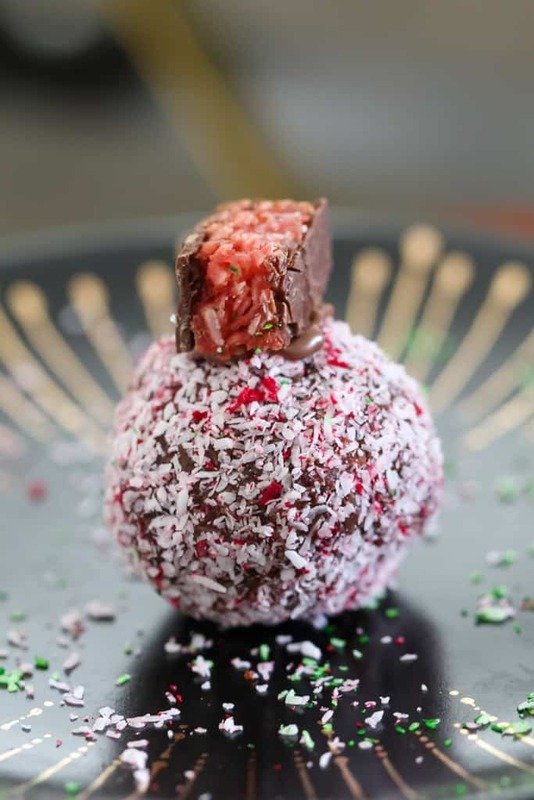 Coat the balls in the red coconut. 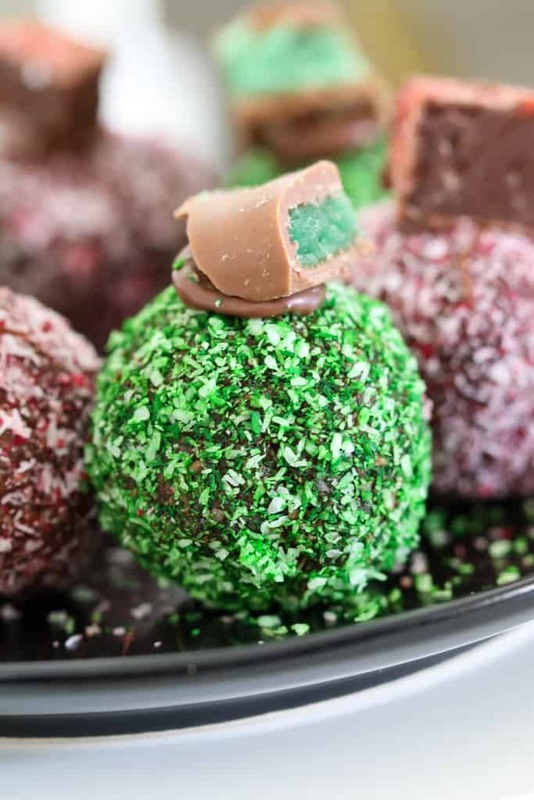 Add a small amount of melted milk chocolate to the top of each ball and add a small square of chopped Cherry Ripe to decorate. Chocolate Ripple biscuits are made by Arnotts and are available in any supermarket in Australia. If you are unable to buy chocolate ripple biscuits, any plain chocolate biscuit will be fine. Place the chocolate ripple biscuits and the Peppermint Crisp bars into a food processor and process until they resemble fine crumbs. If using a Thermomix, mix on Speed 8, 5-10 seconds. Place 1/2 cup of the extra coconut into a ziplock bag. Add the green food colouring and shake until the coconut is coloured green. Place into a bowl. 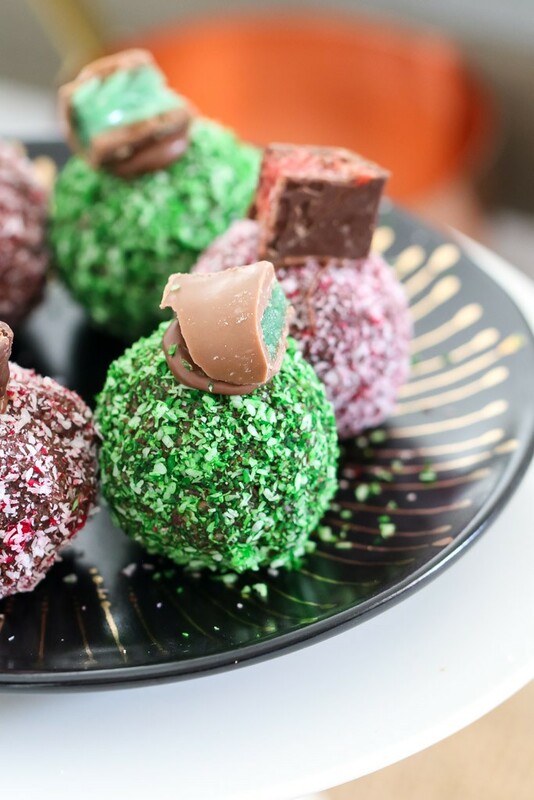 Coat the balls in the green coconut. 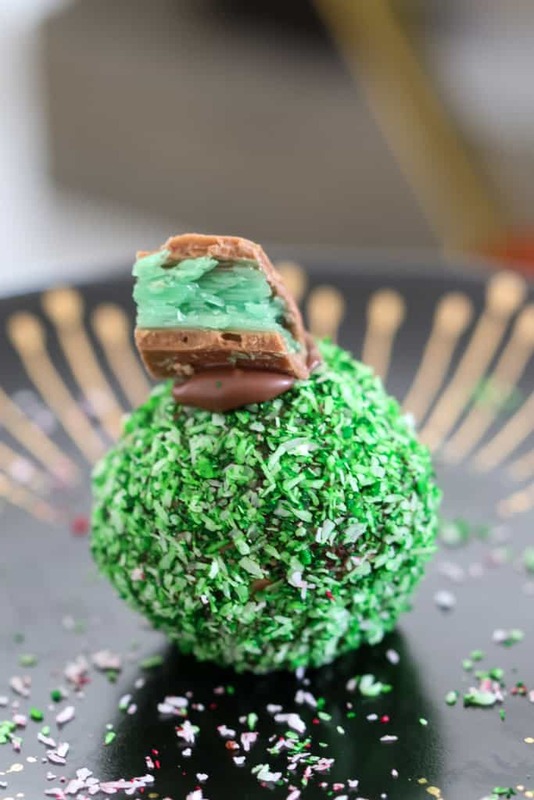 Add a small amount of melted milk chocolate to the top of each ball and decorate with a small square of chopped Peppermint Crisp bar. It looks yummy!! I’ll definitely try to make this one for my kids and I am sure that they will like this one.Thanks for sharing such easy and tasty recipe!! Thank you! I hope they enjoy them too! I haven’t tried that.. but yum! I thought it was Peppermint Crisp and Turkish Delight on FB lol which I think I am going to try as well as these two, yummy! Ohhh that would be so good!!! Definitely trying that next year!